(Gen- 325, OBC- 154, SC-200, ST-33). Age of the applicant must be between 21 years to 42 years as on 01-July-2017 to apply for MO Jobs. Qualifications needed for the current Jobs in Uttarakhand UKMSSB Recruitment is MBBS Degree or equivalent educational degree from recognized university. Applicants with the above said qualifications and should be physically fit are required to go through Uttarakhand official website https://ukmssb.org. Open the link and read the advertisement. Fill the application with the instructions and upload through online before 20-10-2017. Candidates of General & OBC need to deposit application fee of Rs. 2000/- and SC/ ST/ other candidates who are domiciles of Uttarakhand need to pay application fee of Rs. 1000/- through Net Banking/ Debit Card before 30-11-2017 (Date Extended). Uttarakhand UKMSSB Selection Board will conduct an Interview to select candidates for Medical Officers posts. 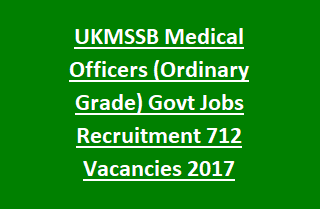 More details of Qualifications, Experience, Age limit, Relaxations, Application procedure, Important dates of Uttarakhand Medical Service Selection Board UKMSSB Recruitment Medical Officers vacancy details are mentioned below. Total available vacancies in Uttarakhand UKMSSB Recruitment are 712 posts. Post Name: Ordinary Grade Medical Officer: 712 posts. MBBS Degree or equivalent degree from the university recognized by MCI Medical Council of India. Worked in the Territorial Army for a period of 2 years. Please see the UKMSSB Notification for other qualifications. Relaxations in age applicable as per Uttarakhand Govt rules. Pay Scale for Medical officer Jobs is Rs. 56,100/- to Rs. 1,77,500/- plus other benefits. Selection Board will prepare list of candidates for selection based on the marks obtained in Interview. If more than one candidates got equal marks, older candidates shall be preferred. Applicants with physically/ Mentally fit with all essential criteria may go to the Uttarakhand Official website https://ukmssb.org. Click on the recruitment notification and read the instructions. Fill the form carefully and Save. Upload the recent photo and signature with application form. Last date for submission is 20-10-2017.